I have tried many times putting the kids toothbrushes in a ‘decorative’ toothbrush holder. I found that inside the holder got very grotty quickly and with little ones splashing water when using the basin I was always wiping up water puddles around it. Then I found this fantastic plastic suction basket at Woolworth’s and it has been perfect. The toothbrushes are off the bench making it easier for me to wipe the vanity top. We use a lot of face washers. The kids have 1 each when having a bath/shower, then as kids do, they grab another to wash their face after meals. As we use so many I don’t bother folding them, I also have this ‘thing’ that we only use them once, then I wash them (will explain more in tomorrows post about quick clean of the bathroom). Instead when folding washing I throw all the washers into one pile then just place them into a drawer in the bathroom for easy access. 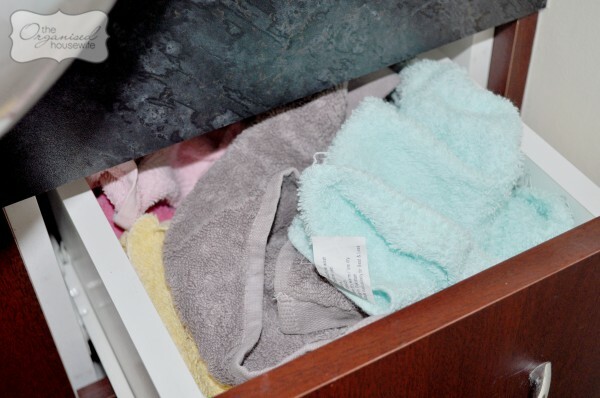 They are hidden in a drawer so no need to make a neat pile. I don’t store the girls hair ties/brushes in the bathroom, one because we don’t have enough room (the vanity and drawers are very small) and two, because they have so many. 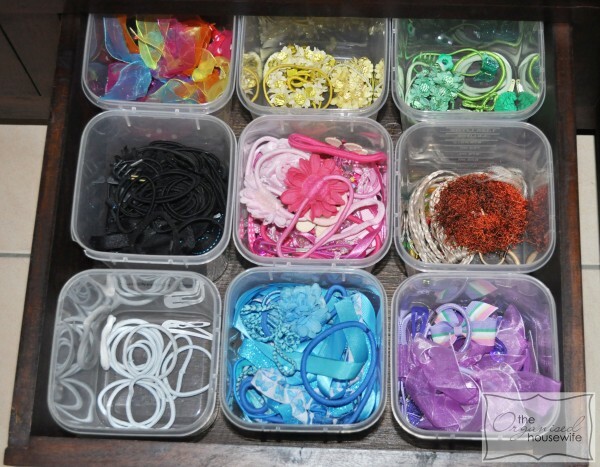 You will find more details about how I organise their hair ties etc in a post I wrote Back to School – Organising Hair Ties. As far as your other child being a “carrier” – this would mean he/she is still infectious !! I think what is meant is that this child either has a sufficient degree of immunity from vaccination or sub-clinical infection (they got such a mild ‘dose’ they did not develop symptoms) or somehow managed not to be exposed to the varicella infection your other kids had! A serology test (seroconversion antibody levels) cam be done to determine immunity if you are concerned. Any infection is a battle of balance: the exposure level & virulence of the germs versus your conquering immune response. Seroconversion efficincy differs between people and vaccine type. If anyone has not had either chicken pox or the vaccine I highly recommend the vac – it is NASTY as an adult!! 21 days after my kids had supposedly stopped being infectious I went from hospital emergency dept (being soo sick) to acute care to being sent to isolation with my own nurse when they discovered my first welt…then being discharged as soon as my obs were stable but having to walk out in a mask!! Just wondering what section in Woolies you found the suction cup baskets. I had a look today at the one near me but couldn’t find any. I think it is a great idea! We also have the decorative toothbrush holders but I don’t like the yukky stuff that grows inside. Ewww…. Hi, I had trouble finding the bathroom caddy too, but found it in Coles, in the gladwrap isle (random) just hanging, as they do with other little bits and bobs for impulse buying. It wasnt where I thought to look. I think these shopping centres need some organising. I love how your hair items look in the drawer- very easy to find everything! I have a teen daughter and here’s the best thing we did for the bathroom- I put a cool looking large wire square basket on the counter for our hot irons and blow dryer. My daughter would unplug her flat iron but since it was still hot, she would leave it on the counter which would drive my Hubby nuts but now that I have the metal basket, she can just unplug it and put it in there to cool leaving my counter clutter free! That’s a great idea! I leave my straightener out because of that same reason and then have to remember to go back and pack it away (with running around after my 3 kids though this can be a long while after it has cooled). I love this idea, thank you! 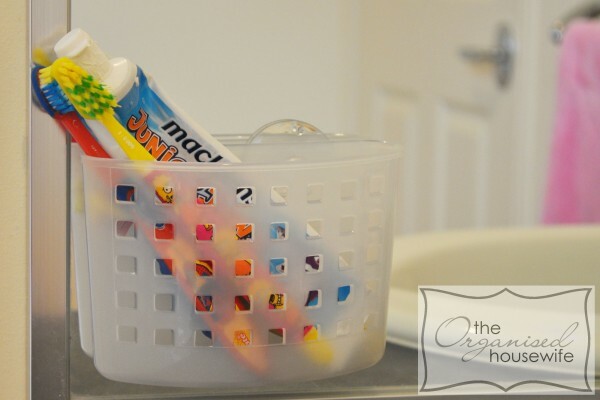 I will be looking for one of those baskets this week – soooo sick of the grot inside the toothbrush holder! I run ours through the dishwasher once a week because they get so disgusting (and all the grot comes out of the bottom and goes all over the bench – eww! I never thought of putting them through the dishwasher, this one is plastic, so I am sure it is possible, great idea, thanks Shannon! I do the same with washers. I also keep the used ones in an old colander until the day I wash towels and washers. 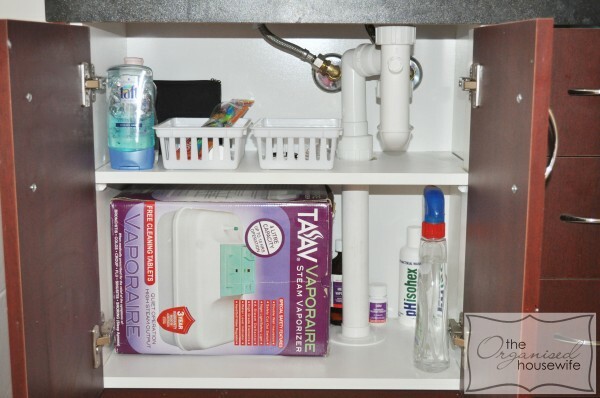 Thanks for the idea to keep the vaporiser in their bathroom perfect placement for it, these things just don’t occur to me sometimes having moved from such a smaller home I just put things where they had to be kept before sometimes and haven’t been here for long enough to think these things through IYKWIM. That is what this blog is perfect for, just to give a simple idea. LOL….I have 2 drawers full of washers (they are very small drawers) and the girls keep some play make up in the bottom drawer…..nothing exciting. That’s such a great price. $3 and it will save so much time with cleaning. Love a tip earlier to put in the dishwasher to clean as well. What an awesome idea! I am currently building my home and CANNOT WAIT to move in so I can begin putting all of your organisational tips to good use. I am going to be so organised I won’t know what to do with myself! Graet idea to get all the tips before you move in. Then you can move in with a plan of attack! Good luck! Those little hanging suction baskets are great in the kitchen also. I put the dish brush and straw brush cleaners in it (for my daughters baby cups) and it hangs off the wall over the sink. So very versatile. I have also been putting it in the dishwasher to give a quick clean. omg, you are amazing. I can not let my husband see your blog or he will fall madly in love with you!! Oh this made me laugh so much! Just wondering, do you use the same basket for your own toothbrushes, this brush thing has been driving me nuts!!!! Love your blog. I am a little concerned from a hygiene point of view all the toothbrushes are touching!!!!!!!!! 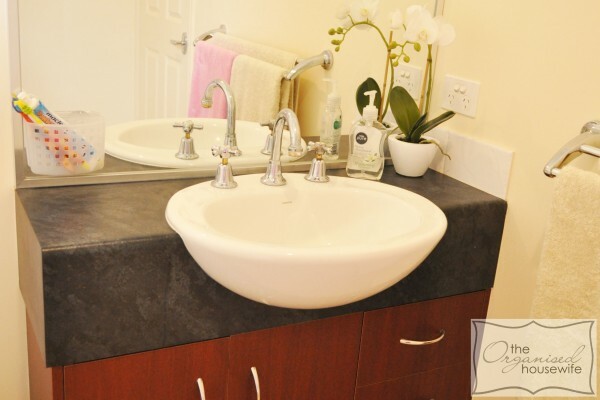 Such great ideas, kids bathroom is now clean and decluttered. Yay!